Quick, what was the first thing I did after coming home from CES this past January? Sleep it off? Nope. That was the second thing I did. First thing I did was dig out my old iPod nano and register for Apple’s replacement program. Why? Because I’m an uber-nerd. And also because I caught smart watch fever at CES. 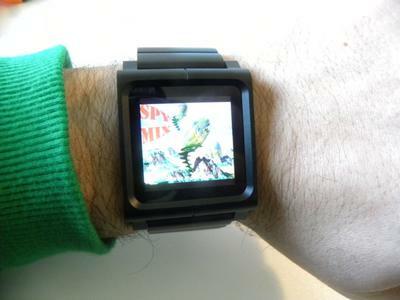 No, Apple’s iPod nano isn’t really a smart watch. It can’t connect to a network or a network-enabled device like a smartphone, so it can’t deliver text messages, social network updates or other little nuggets of information from the Web. Mainly, all it does is play music, display photos, and function as a pedometer/last-gen Nike+ fitness tracker. Nano does tell the time, and its 18 pre-installed watch faces are cool, but it’s actually kind of a lousy watch because in order to see what time it is you have to first physically press a button in order to wake it from sleep. As such, I’m looking forward to the eminent release of Sony’s SmartWatch, which promises a host of smartphone-connected functionality. That said, nano-as-watch has spawned a micro industry of watch band accessories and since I was getting a free nano anyway, I figured I’d reach out to a bunch of watchband makers to roundup some of the options available for those of us who want to wear a 1.54-inch LCD display on our wrists. 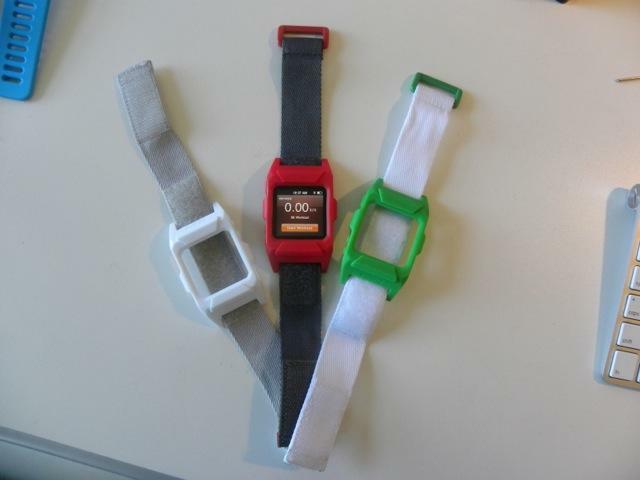 I received nano-compatible watch bands from three companies: Incipio, iWatchz and LunaTik. There are other companies out there making nano watchbands, but I was drawn to these three for two very simple reasons: cyan and orange. See, I’ve long had a thing for orange, and recently developed a thing for cyan (thanks, Nokia!). Lunatik just launched a cyan option as part of their their CMYK line of polycarbonate bands, and both Incipio and iWatchz offer orange models. The various PR folk were also smart enough to send along some other samples, since not everyone out there is as freakishly obsessed with orange and blue as I am. Incipo’s NGP Wristband system combines interchangeable cases and bands available in an array of bright colors. Cases are made from NGP, and the accompanying straps from woven nylon with rubber bumpers, plastic loops, and velcro closures. According to the company, “NGP® material stands for Next Generation Polymer – a durable and shock-absorbing polymer that is more stretch and tear resistant than silicone.” I received NGP Wristband Cases ($24.99 each) in COLOR COLOR COLOR (one matching color strap is included with each), and NGP Wriststraps ($9.99 each) in COLOR COLOR COLOR. This is the solution I’d imagine snowboarders and wanna-be snowboarders would rock. NGP provides the most nano protection of the cases reviewed here, encasing the iPod’s sides and top edges in colorful polymer while providing full access to the headphone jack and all controls. NGP’s solution was the least comfy and luxe feeling of the units I tested, making the nano itself feel larger and boxier on my wrist than the other straps did. The stitching near the plastic buckle-loop on the wristband also irritated my wrist from time to time. But all in all NGP is acceptable, and you might dig the bulky, exposed velcro look for the same reasons I didn’t. Wearing the white case with a grey band made me feel like a Stormtrooper, and NGP is one of the lowest cost ways to set yourself up with a variety of mixed and matched case/wristband colors to match your moods. And the color of your snowboarding outfit du jour. 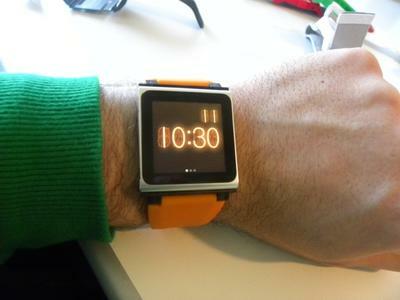 iWatchz sent me two models, a Q in orange and a Carbon with white stitching. One thing I really like about iWatch’s bands is their “Press, Slide, Click!” nano mounting system. The mount takes advantage of nano’s belt clip by way of clever cutouts in the “iWatchz clip.” To attach nano to the clip you press the belt clip, hold it open while sliding the iPod onto the clip, and let go. 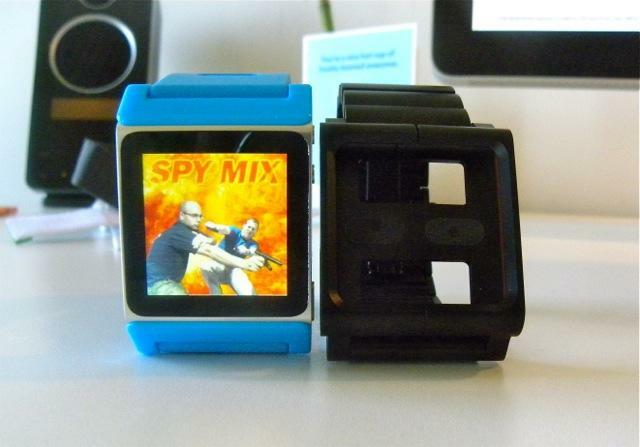 Nano’s belt clip latches down around iWatchz’s cutouts, and your iPod is securely mounted to the watchband. The system works, and offers the flushest mount imaginable, lowering the overall size and height of your nano watch just a bit as compared to the other bands reviewed here. Q ($24.95) is made from silicon with stainless steel hardware and a polycarbonate clip. The band offers up a lovely, minimalist mount that compliments nano with that matte silver clip. Lightweight and soft to the touch, the silicon band was comfortable to wear all day, and made it easy to remove the iPod for use at the gym and then reattach it afterwards. My orange sample’s color was slightly muted, which I found to be a good thing since orange is inherently pretty bright. If ever there was such a thing as, “a pleasantly subtle shade of orange,” iWatchz found it; I found I liked it best with the orange digital watch face (the vacuum tube-ish one, not the dashed border one). Q also comes in red, white, grey and black for those who don’t share my orange obsession. Carbon ($49.95) steps up the iWatchz game with a textured leather band and aluminum clip. My sample featured white stitching which, combined with the “carbon fiber patterned” band, gives the whole affair a sports car sort of feel. Carbon is well-made and looks nice on the wrist, if you dig the patterned leather look. LunaTik started out as a Kickstarter project, raised nearly a million dollars via crowd funding, and is now a full-blown company making iPod and iPad accessories. As mentioned above, my Cyan obsession led me to the company’s cmyk TikToks. 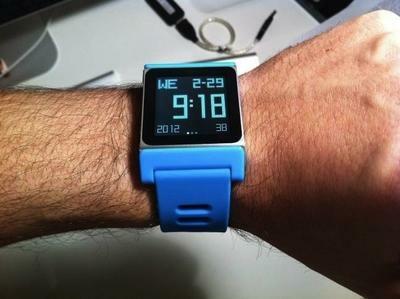 LunaTik PR was kind enough to send me a cyan TikTok as well as a Link Blackout for review. 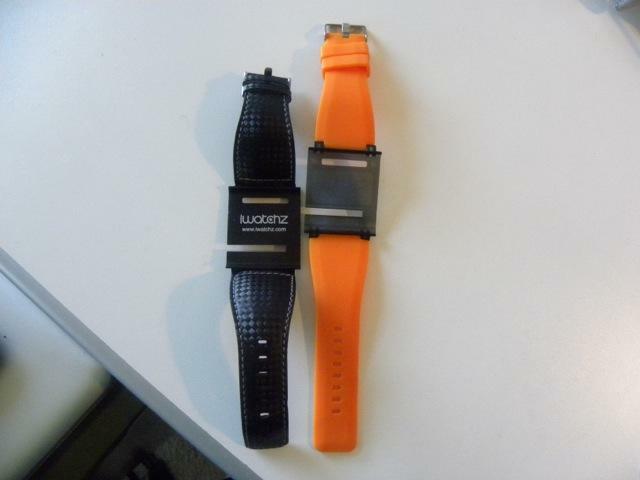 LunaTik’s “watch conversion kits” cost more than the competition, but they’re top notch goods. 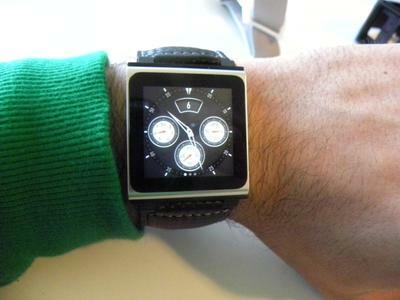 The fanciest of all the nano watchbands here is undoubtedly LunaTik’s Lynk Blackout ($139.95). Constructed with an “aerospace grade aluminum frame” and “anodized aluminum band with a silicone underbelly,” Lynk combines the all-metal style of a link bracelet with the comfort of silicon, and not metal, against your skin. Smart, huh? Also available in Silver for ten dollars less, the Blackout version sports PVD plated buckles and hardware. No doubt Blackout is a sleek, modern take on the metal bracelet band, but it’s a bit fussier than the other solutions mentioned here. First, you have to fit the band to your wrist size by removing links (as with any link bracelet). Next, you have to use a tool to unscrew and disassemble the frame to slot your nano in and out. And last but certainly not least is that steep price tag: $140 for Lynk is more than the $130 Apple charges for the entry-level nano itself. That said, Lynk looks and feels premium, and if you’re not planning on snapping your iPod in and out of your watchband on the regular, the whole screw-it-in design actually affords an extra level of secure protection without getting in the way of nano’s ports and controls. I only find myself with an iPod nano on my wrist right now because I had an old nano lying around that turned out to be eligible for Apple’s free replacement program. That said, now that I’ve got it and had the chance to try out a bunch of different wristwatch conversion kits, it’s a fun alternative to my other watches (yeah, yeah, I’ve got two or three others). $130 + $25+ for a “watch” that requires you to press a button and wait a beat every time you want to see the time is kind of silly. Spending an extra $25 or so on a strap to turn the nano you already have into a fun piece of wearable tech seems a bit more fun and a bit less nonsensical. 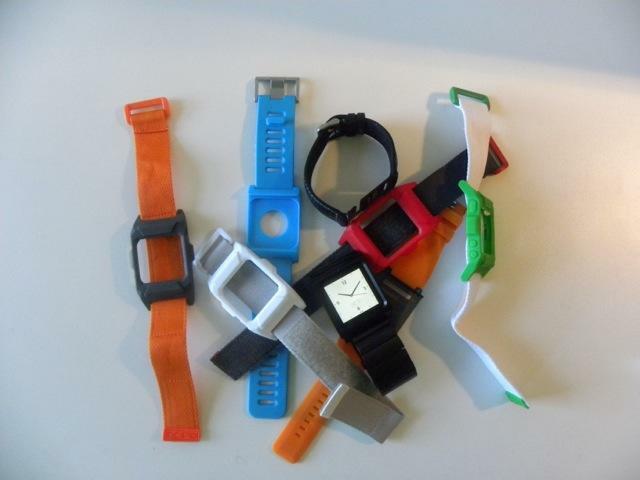 Any of the above solutions will get your iPod onto your wrist, and there are plenty more styles and materials to choose from in the nano watchband world beyond the handful covered here. Objectively speaking, LunaTik’s samples are the highest quality of the bunch, though iWatchz’ models came in a close second. Incipio’s NGP system is cheaper in price and feel, though there’s nothing to suggest that they won’t get the job done day in and day out; and, they offer the cheapest path to different color watchbands for each day of the week. All of that said, it’ll be interesting to see if smart watches catch on this year – if they do, Apple would do well to cram a bluetooth radio into iPod nano in order to open up a host of iPhone-hosted connected functionality. 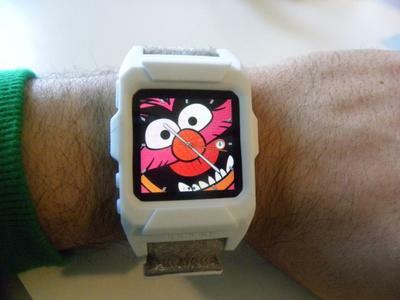 In the meantime I’ve got my eye on that Sony SmartWatch. It’s already up for pre-order from a few online retailers, along with a half dozen interchangeable wristbands. Smart and colorful? Sounds good to me.